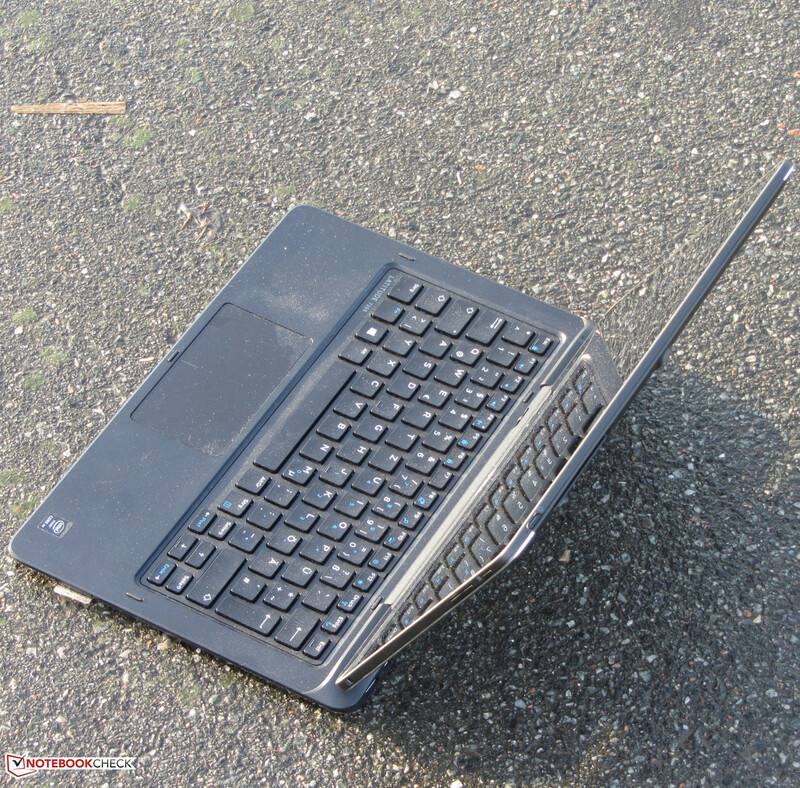 Ultrabook Convertible. 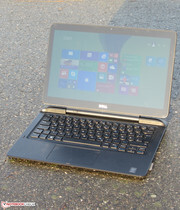 Dell’s Latitude 13 7350 is a mixture of an Ultrabook, a tablet and a convertible. The combination of silent operation, good keyboard and long battery runtimes make it a companion for business users. 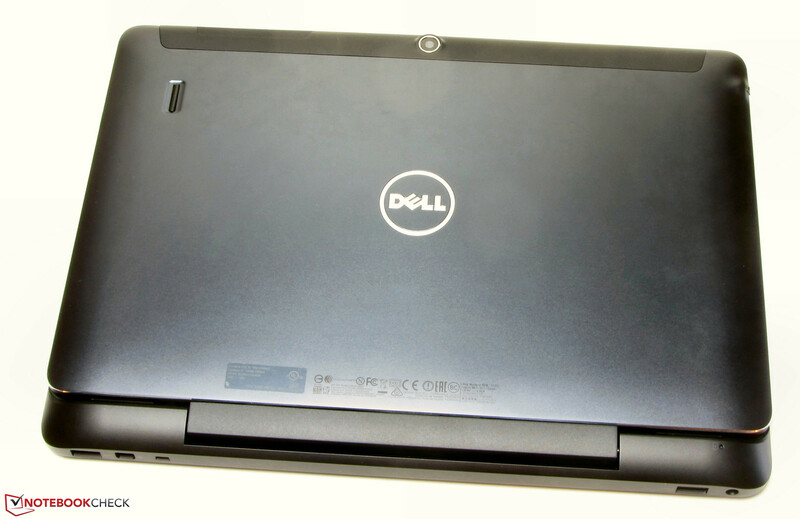 The Dell Latitude 13 7350 is a device from the category detachable PC/Convertible. 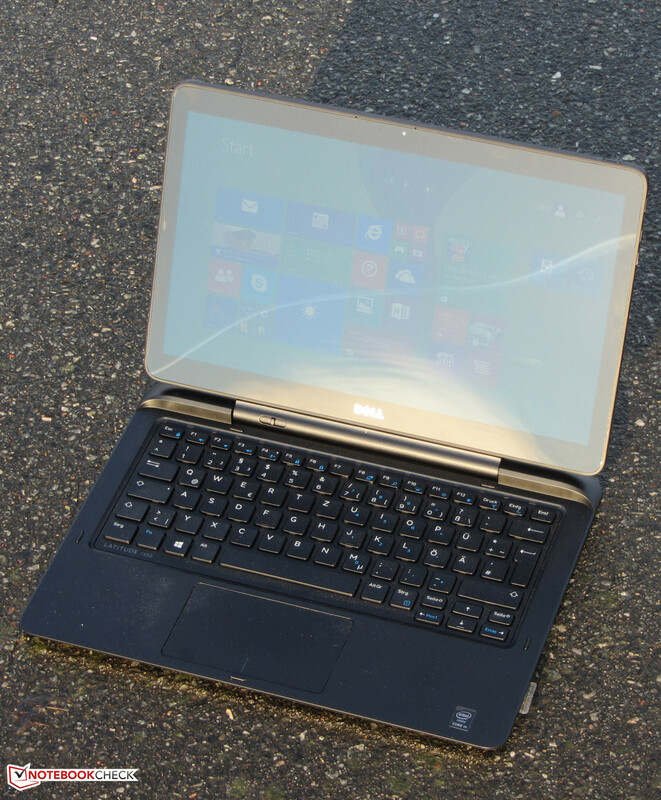 Dell combines a passively cooled 13.3-inch tablet with a keyboard dock. The device can be compared with an Ultrabook when it is closed, and it is designed for business users: TPM, a fingerprint reader and a SmartCard reader are available. Our review reveals whether the device is a good alternative to conventional 13.3-inch or 14-inch notebooks, respectively. 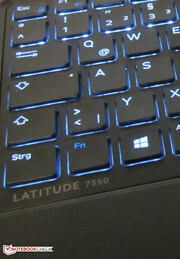 The Latitude combines several product categories in one device, which means the rivals are from different categories as well. 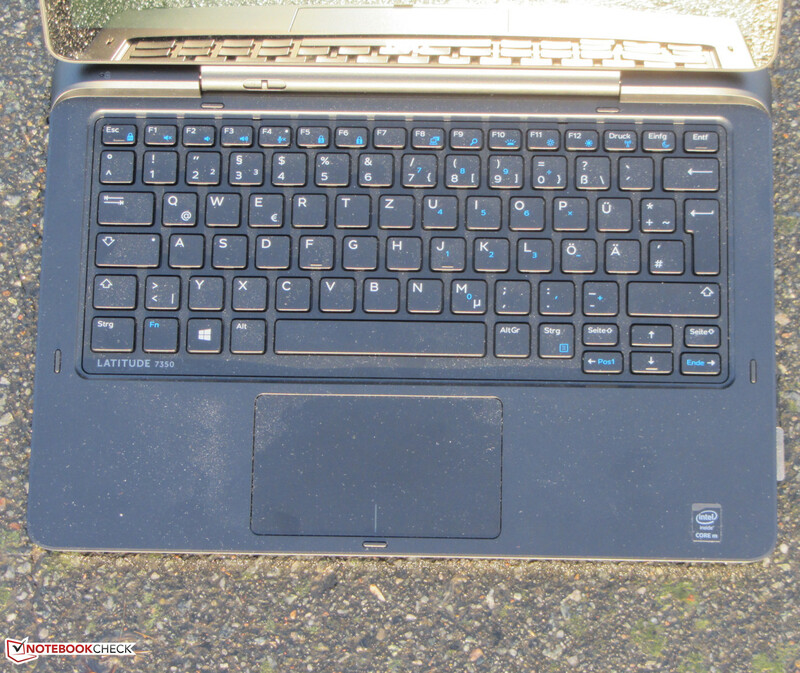 For instance, the typical convertibles with a rotating display like the Fujitsu Lifebook T904. Tablets like the Microsoft Surface Pro 3 are also competitors, the same as normal Ultrabooks with or without a touchscreen – for example, the Toshiba Portégé Z30t-A-10X. 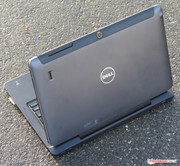 The case of the device is completely black and Dell uses matte surfaces. 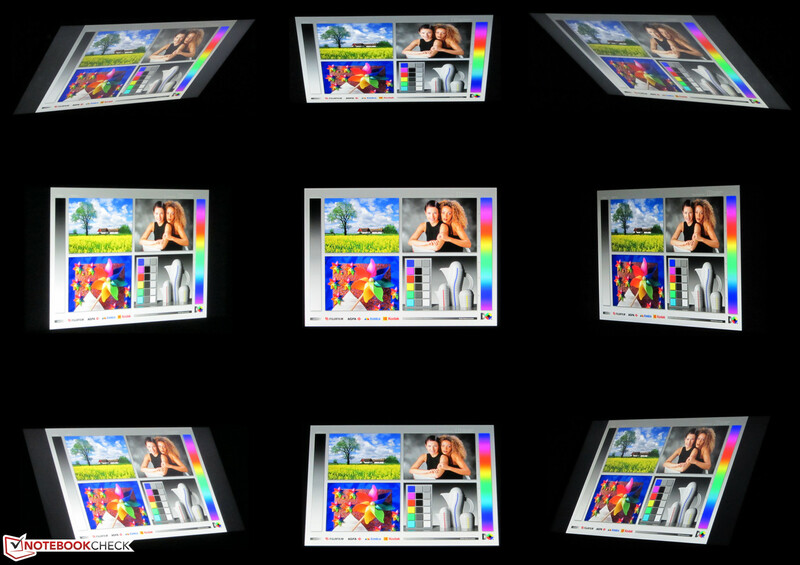 Only the display and the display frame have glossy surfaces. 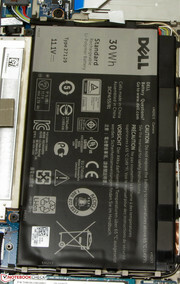 The back of the tablet and the bottom of the dock are made of metal, while the rest of the chassis is made of plastic. The tablet has a mechanical connection with the keyboard dock. A small lever can release the docking mechanism. 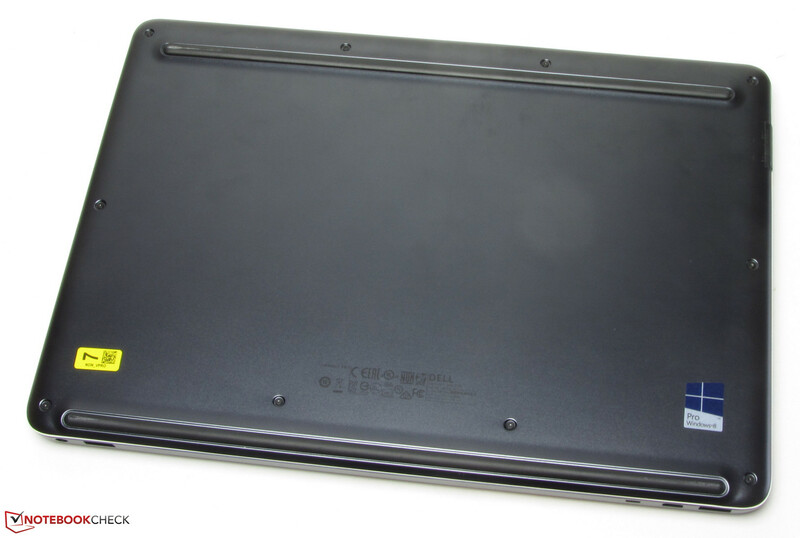 It is easy to access the hardware of the tablet since you can remove the back cover, which is only secured by plastic clips. Screws are not used. The device has a good build quality, only the stability could be better. 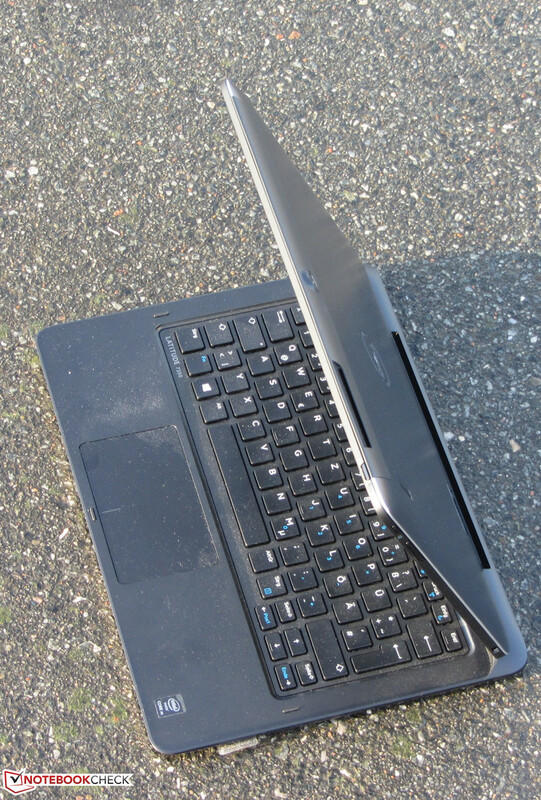 It is possible to twist the tablet slightly; the keyboard dock on the other hand is much sturdier. The dock reveals the same issues that we know from many notebooks. You can easily dent the dock with some force next to the sides of the keyboard. The hinge allows a maximum opening angle of only around 120 degrees since the device would tip over at a wider angle. 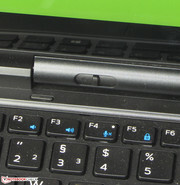 The hinge keeps the tablet element well in position; it is not possible to open the device with one hand. The closed device. 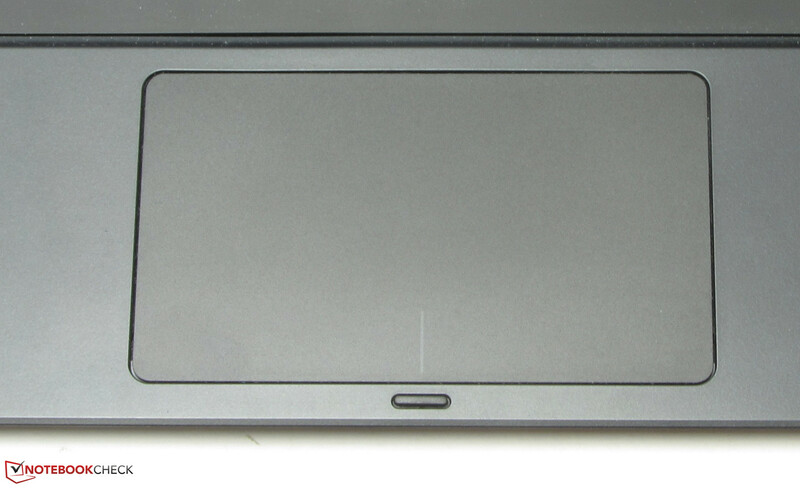 At the back of the tablet are the fingerprint and SmartCard reader. Maximum opening angle of the "display". 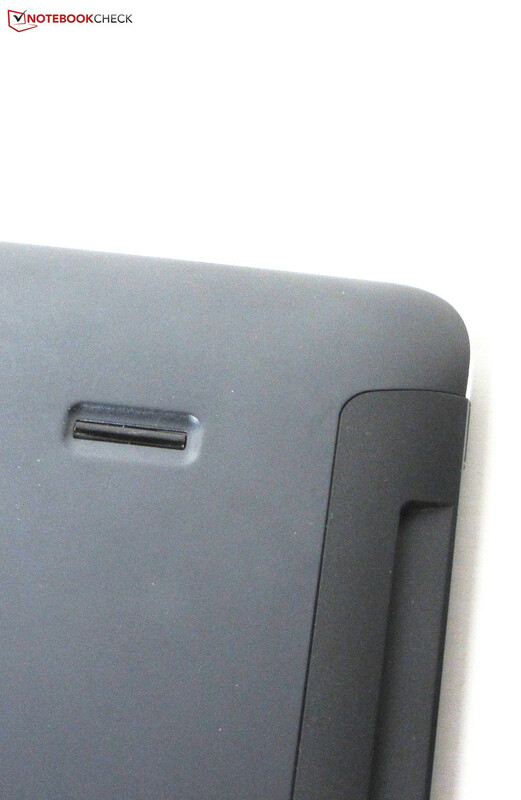 As well as a combined stereo jack, the tablet itself also has a fingerprint reader, a SmartCard reader and its own power connector (at the bottom of the tablet, not usable in combination with the dock), but there is no USB port or card reader. 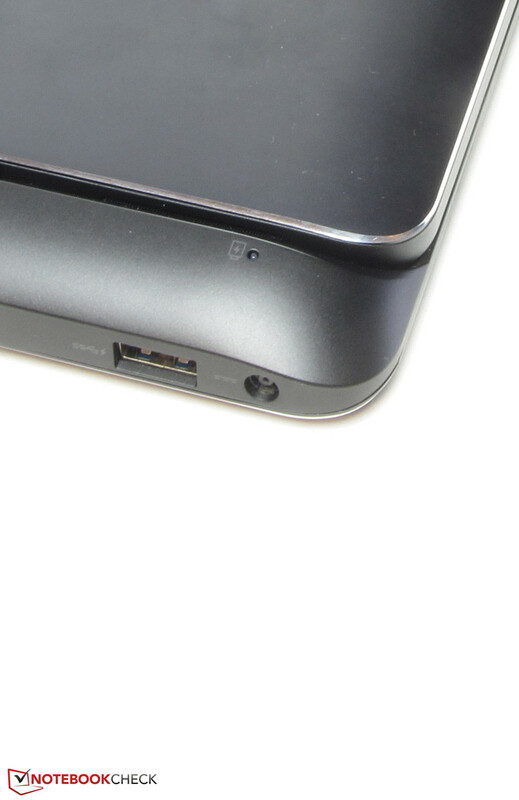 These ports are located on the keyboard dock. Dell has equipped the dock with the essential ports: A Mini DisplayPort can be used to attach external displays as well as two USB 3.0 ports. Additional ports can be used with separately sold adaptors (USB 3.0 to HDMI/VGA/Ethernet/USB 2.0) for the USB 3.0 port. At the left side of the tablet is the combined stereo jack. 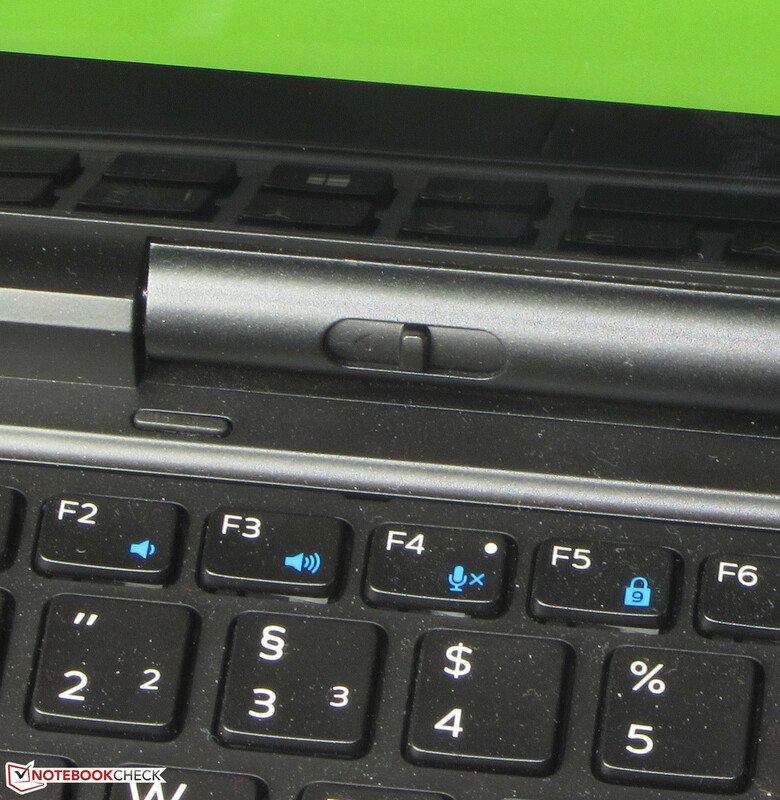 At the right side of the tablet is the Windows button, the volume rocker and a slot for a Kensington Lock. At the top of the display is the power button and the SmartCard reader. 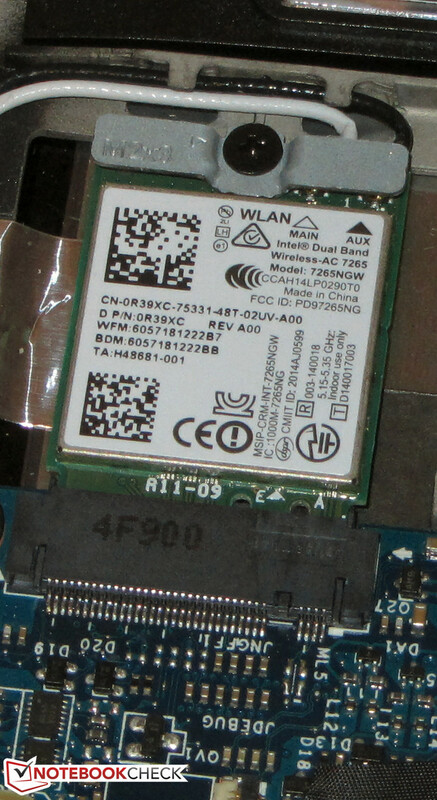 Network connections can be established with the WLAN module from Intel (Dual Band Wireless-AC 7265). It supports the WLAN standards 802.11 a/b/g/n/ac. The connection with our router was always stable within a 15 m (~49 ft) radius. 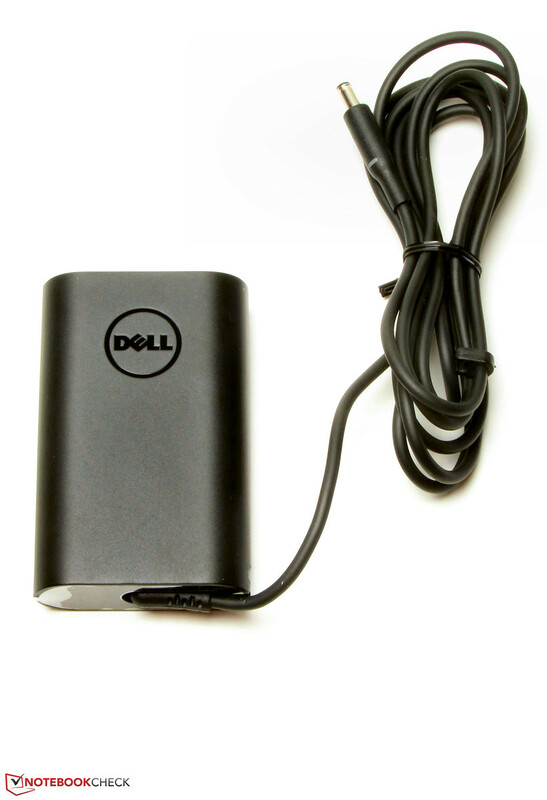 Wired network connections require a corresponding USB adaptor and Dell sells such a model. 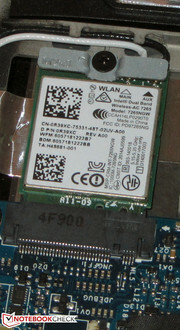 A Bluetooth 4.0 module is also integrated. Our review unit does not have an LTE modem, but it is available as an option (Dell Wireless 5810e) for an additional charge of around 60 Euros (~$71). The tablet element has two cameras: The webcam has a resolution of 2 megapixels, while the sensor on the back takes pictures with a resolution of 8 megapixels. Neither of the two cameras takes really good pictures. 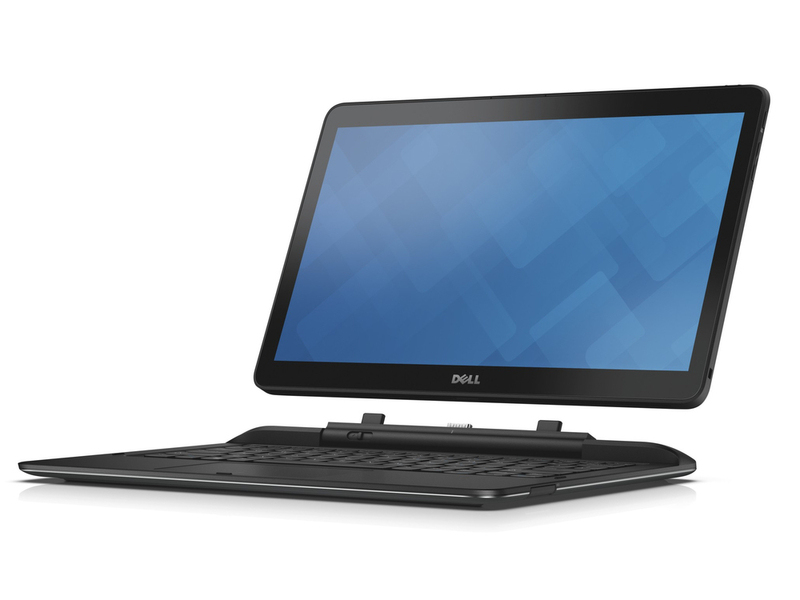 As befits a business device, Dell has equipped the Latitude with several security features. Slots for Kensington locks at the dock and the tablet ensure protection against physical thefts. The access can be realized via fingerprint reader or SmartCard. An NFC module is also integrated, which means the SmartCards can be read wirelessly. The Latitude is obviously equipped with a Trusted Platform Module too. The device is shipped with a quick-start poster and some security information. A recovery USB stick is also included. 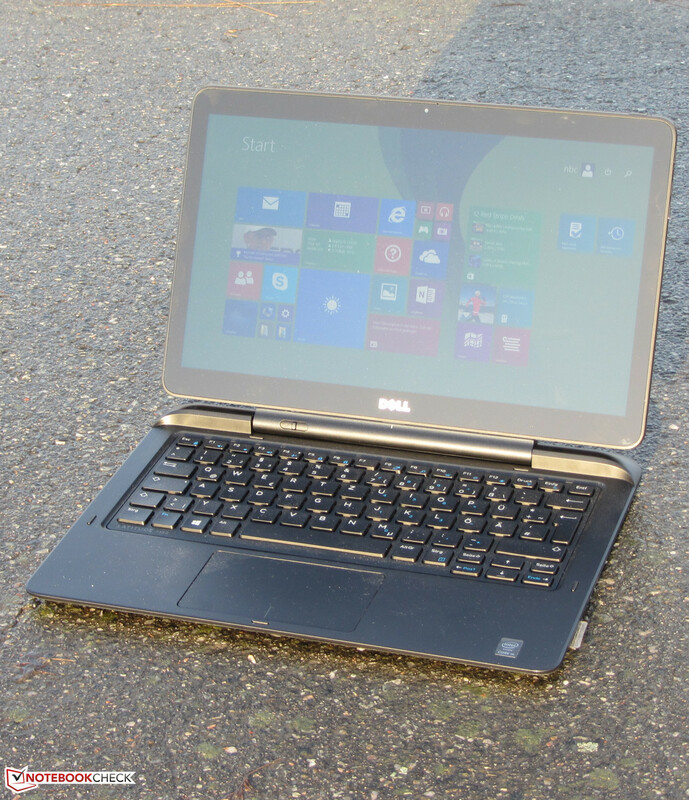 The Latitude is preloaded with Windows 8.1 Pro (64-bit) and a recovery USB stick (USB 3.0) is provided. It can be used to install Windows after you have replaced the Solid State Drive, for example. 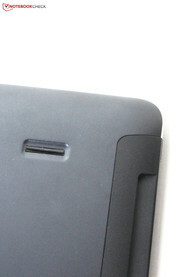 It is possible to access the hardware of the tablet element since the back cover can be removed. Dell does not use screws and we did not have any problems removing the cover with a sharp object. 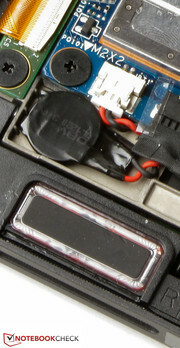 But you should be careful: The fingerprint reader, which is attached at the back, is connected to the motherboard via a flat cable. 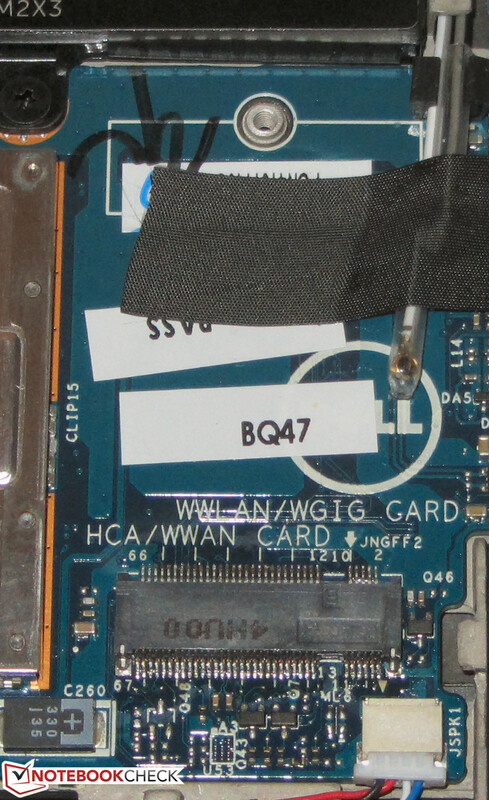 After the removal you can access the SSD, the battery as well as the WLAN module. 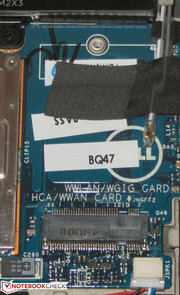 The device uses an M.2 SSD (full size), which can be replaced with another drive. The battery can also be changed since it is secured by screws only. The Latitude has a three-year on-site warranty (standard warranty). 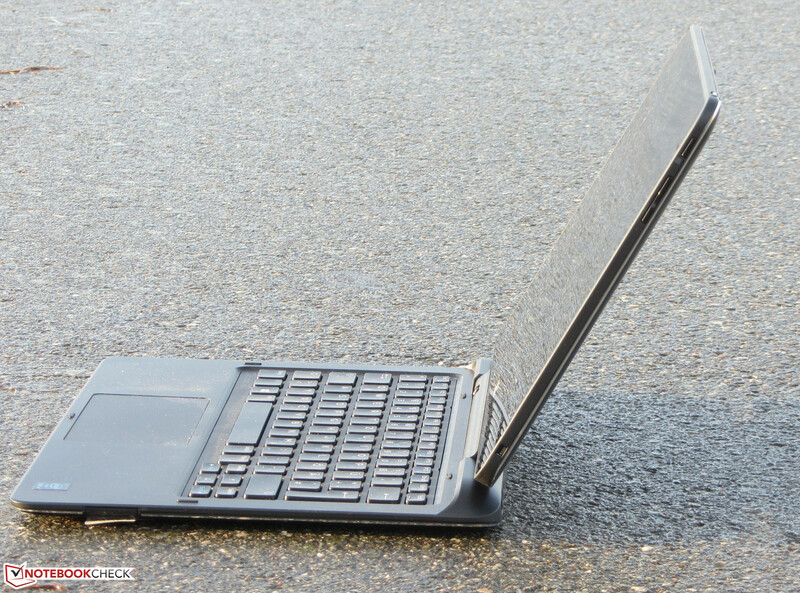 The rival Fujitsu Lifebook T904 has a 36-month warranty period as well. Toshiba on the other hand, only offers a warranty period of 12 months for its Portégé Z30t-A-10X. As is usual with Dell, you can purchase many extensions, a five-year warranty, for example, is available for around 60 Euros (~$71). 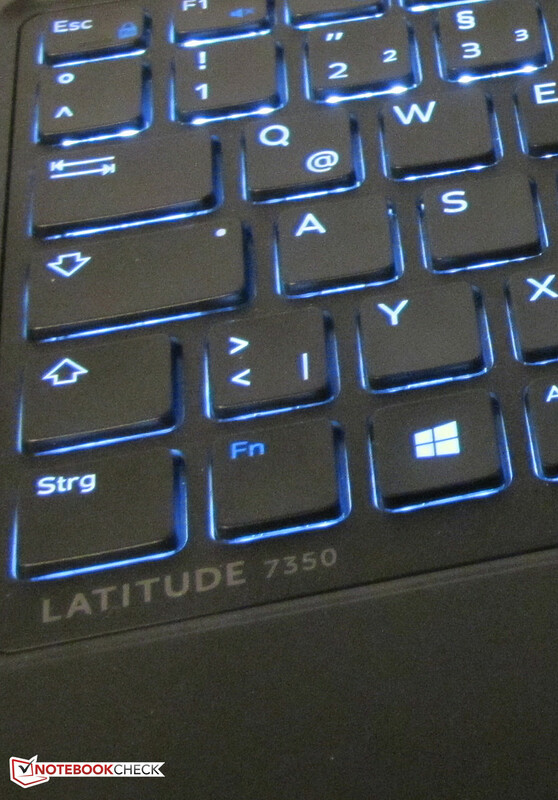 The keyboard dock of the Latitude accommodates an illuminated chiclet keyboard. The illumination can be adjusted in two steps. Overall, we liked the keyboard: The smooth and concave keys have an average travel and a firm stroke, but the resistance is still pleasant. There is some bouncing during typing, but it was not annoying. The keyboard provides a good typing experience and is also suited for prolonged typing sessions. TThe mouse replacement is a ClickPad (a touchpad without dedicated mouse buttons) with multi-touch support and the dimensions of 10.6 x 6.1 cm (~4.2 x 2.4 inches). The slightly roughened surface provides good gliding capabilities for the fingers, and thanks to the large area, it is easy to execute gestures. The pad has a short travel and a well-defined and audible pressure point. 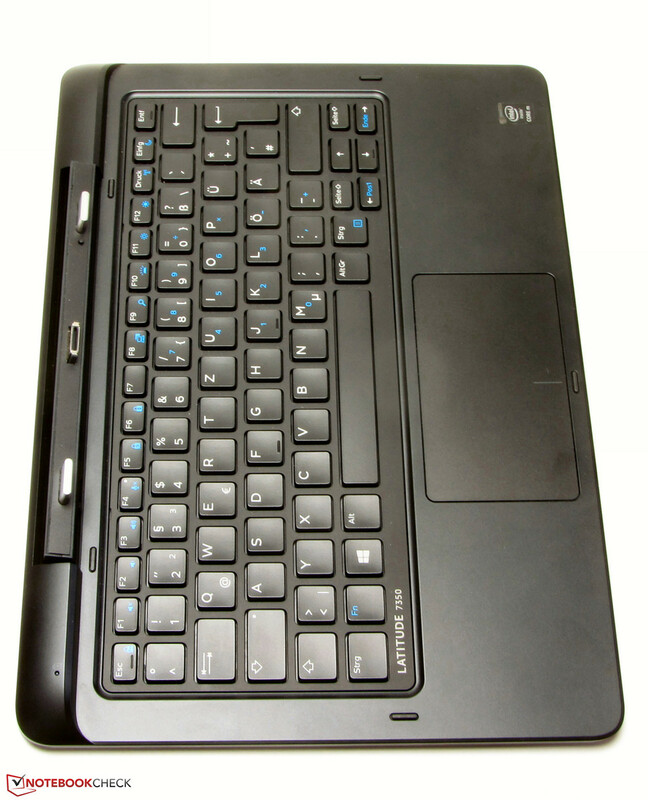 The capacitive touchscreen of the Latitude works without any problems and executes inputs very quickly. The screen can recognize up to 10 simultaneous inputs. 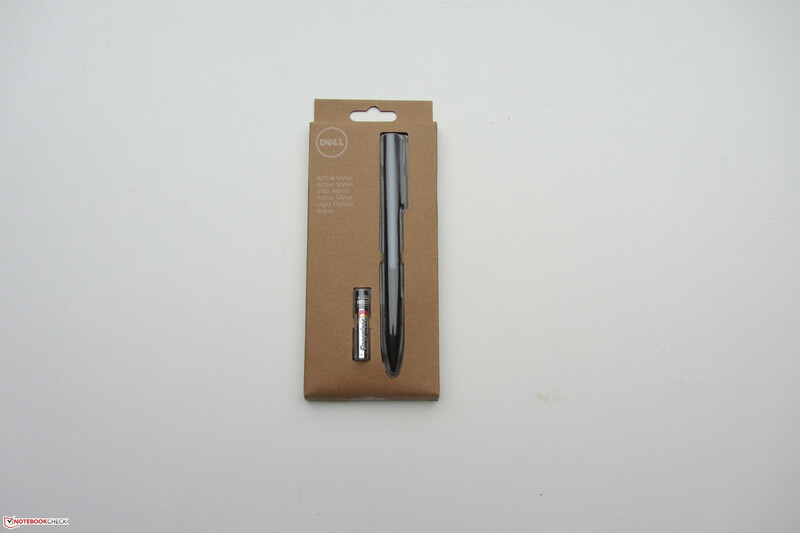 Another input method for users of the Latitude is the Stylus Pen, but it has to be purchased separately. 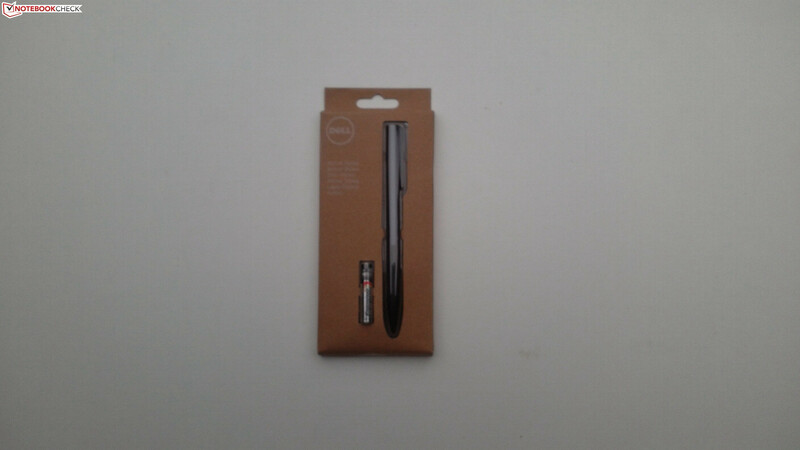 Dell sent us one pen and it worked flawlessly. However, handwritten inputs can become rather tedious after a while. The 13.3-inch display of the Latitude has a native resolution of 1920x1080 pixels and is protected by a layer of Gorilla Glass. The brightness of the panel is very good with 371 cd/m², which can be maintained on battery power. Competitors like the Fujitsu Lifebook T904 (254.8 cd/m²) and the Toshiba Portégé Z30t-A-10X (288.9 cd/m²) cannot keep up with this performance. Note: We will add the luminance grid for the following diagram shortly. 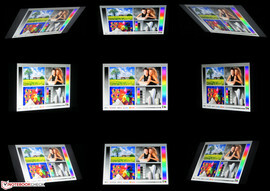 The contrast (1,374:1) as well as the black value (0.27 cd/m²) of the panel are also very good and the results position it between the screens of the Lifebook T904 (1,619:1; 0.16 cd/m²; QHD) and the Portégé Z30t (726:1; 0.43 cd/m²; Full HD). We cannot give you any results for the color space coverage because our measurement device did not work with the Latitude. We liked the colors of the Latitude display with the factory settings. An average DeltaE 2000 deviation of 3.1 means it just misses the target area (DeltaE smaller 3). The display does not suffer from a blue cast. 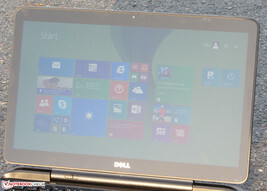 Dell has equipped the Latitude with an IPS panel. Such a panel provides a high viewing angle stability and the content is visible from every position. Thanks to the brightness and the contrast, you can use the display outdoors. 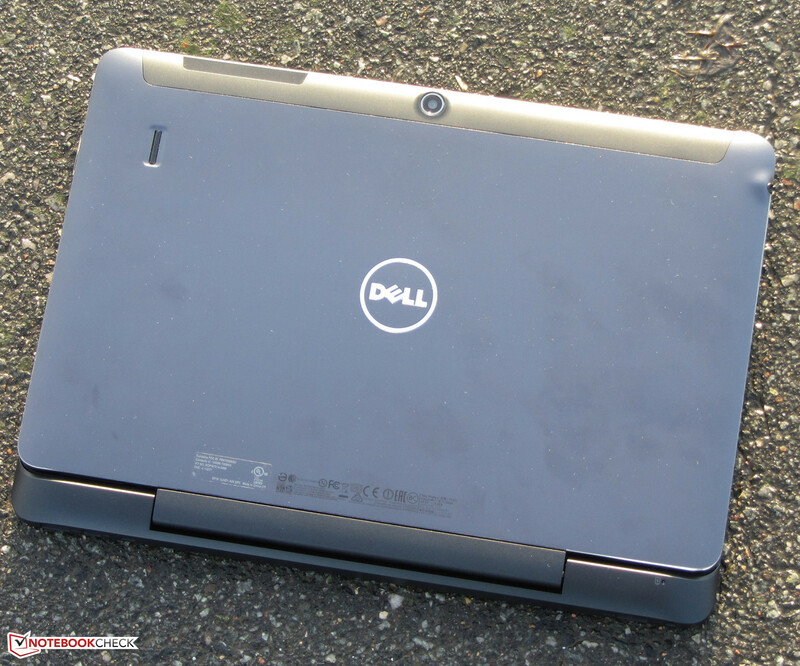 The Dell Latitude 13 7350 is a 13.3-inch business convertible and is powerful enough for office and Internet tasks. You also get business features like TPM or a fingerprint reader. The device is available for a special price of 1,180 Euros (~$1392) at the time of this review; the regular price is around 1,800 Euros (~$2123). 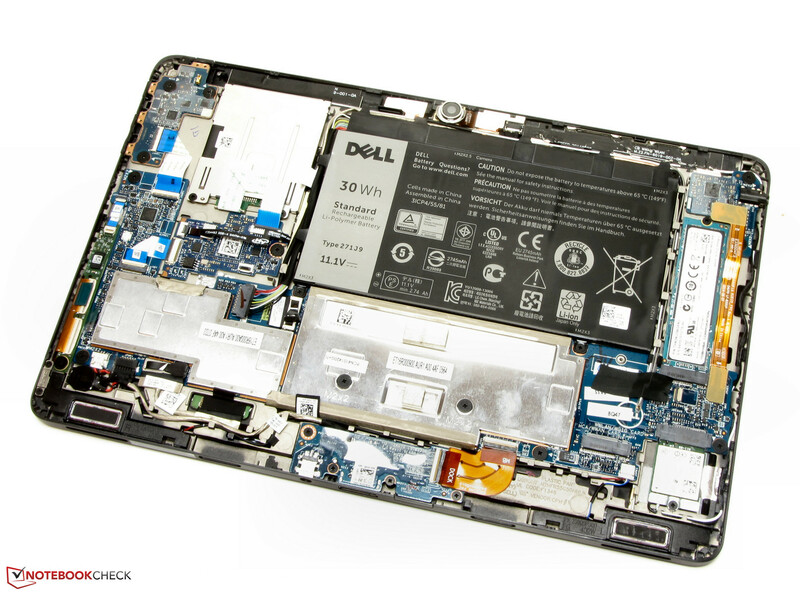 Dell has equipped the Latitude with a member of Intel’s new Broadwell processor generation, a Core M-5Y10 dual-core processor. The "Y" in the designation indicates a very frugal ULV model, allowing passive cooling which is also implemented in the Latitude. The processor has a nominal clock of 800 MHz, but it can reach up to 2 GHz via Turbo Boost. The Core M supports Hyperthreading (every core can execute two threads simultaneously). 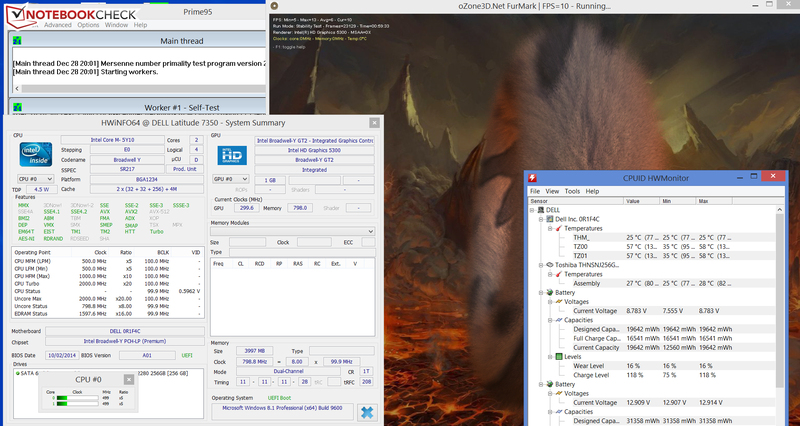 The Cinebench Single-Thread tests show that the CPU can maintain a clock of 2 GHz while the Multi-Thread tests are executed with 1.3 to 1.4 GHz. This behavior is identical for both mains as well as battery power. According to the benchmark results, the single-thread performance is between the ULV Core i3 and ULV Core i5 processors of the Haswell generation, but the Core M is beaten by Core i3 processors in multi-thread applications because it cannot utilize its maximum performance. Thanks to the Solid State Drive, you get a very fast system and we did not encounter any problems during our review period. The results of the PCMark benchmark are very good. The Latitude does fall behind most of its rivals, but this is not surprising since those devices usually have more powerful processors and/or graphics solutions. 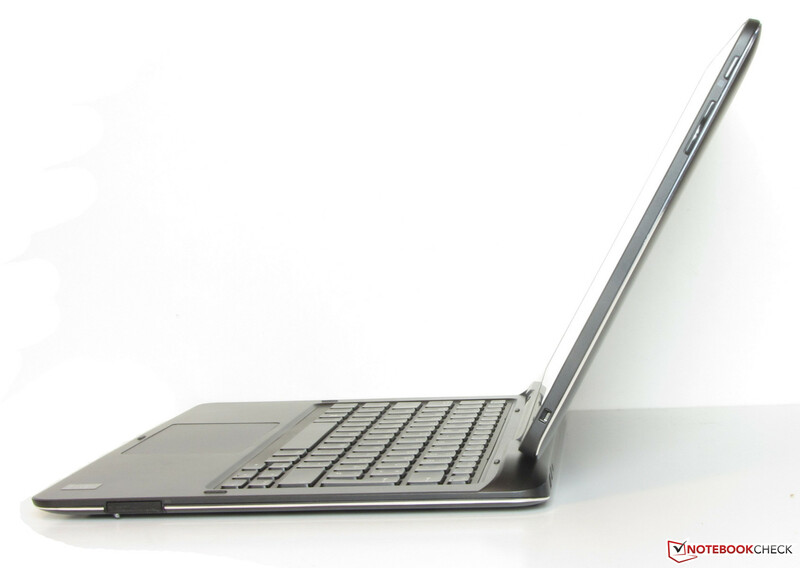 The Latitude uses a Solid State Drive from Toshiba with an M.2 interface and a capacity of 256 GB. Around 56 GB are occupied by the recovery partition and the Windows installation, which means users have around 200 GB for their own files and applications. The SSD manages good transfer rates in general, but the 4k read/write performance is much lower compared to high-end drives like the Samsung 840 Evo. 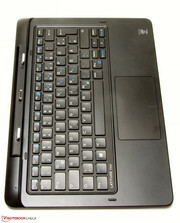 The GPU of the Latitude, HD Graphics 5300, and the CPU are supplied by Intel. The core supports DirectX 11.2, and runs with a clock between 100 and 800 MHz. However, the 3DMark benchmark results show that it cannot utilize its maximum performance. All the results are worse compared to the HP Envy x2 15-c000ng that uses an identical CPU-GPU combination and is also passively cooled. The smaller chassis of the Latitude requires lower clocks to avoid dangerous temperatures. 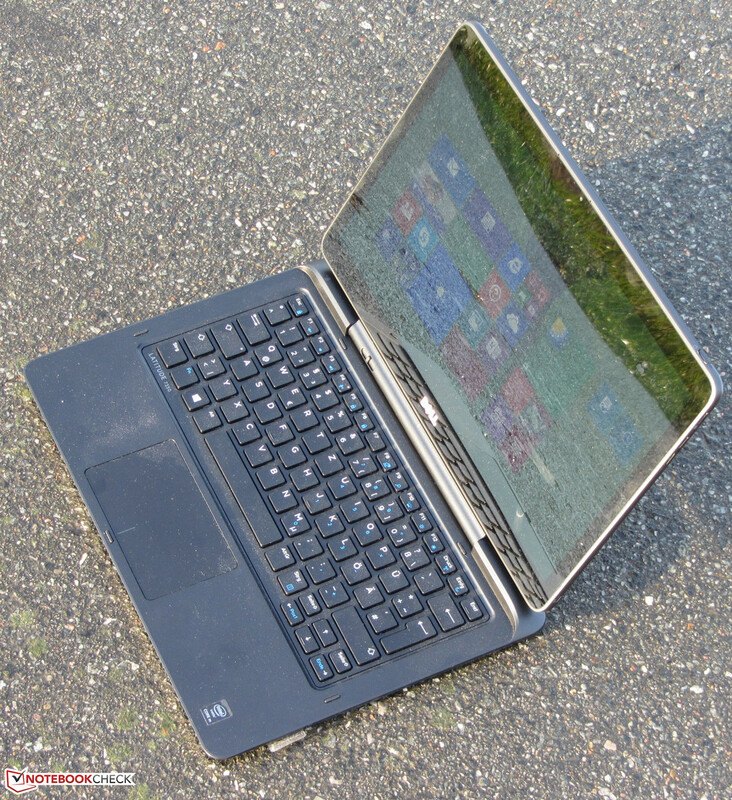 The results of the Latitude are roughly similar to notebooks with the HD Graphics 4200 GPU. The Latitude benefits from the dual-channel memory configuration; the 3DMark results would be even worse with a single-channel memory configuration. The Latitude is a business device, so the gaming performance is not really important. Only some games can be played smoothly with a low resolution and reduced details. If you still want to play games, you should focus on games from the Windows Store, which usually work without any problems. Despite the passive cooling, there is no risk that the Latitude would get too hot. All the measurement spots showed less than 40 °C (~104 °F) during our stress test. The reason for this is simple: The stress test (Prime95 and FurMark run simultaneously for at least one hour) results in a CPU clock of 500 MHz, while the GPU runs with 250 up to 350 MHz, both on mains as well as battery power. The performance limitations should not be that big in practice; our benchmarks showed that the processor can utilize its Turbo Boost. (±) The average temperature for the upper side under maximal load is 33.6 °C / 92 F, compared to the average of 30.3 °C / 87 F for the devices in the class Convertible. 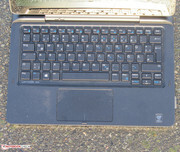 (-) The average temperature of the palmrest area of similar devices was 29 °C / 84.2 F (-9.3 °C / -16.7 F). 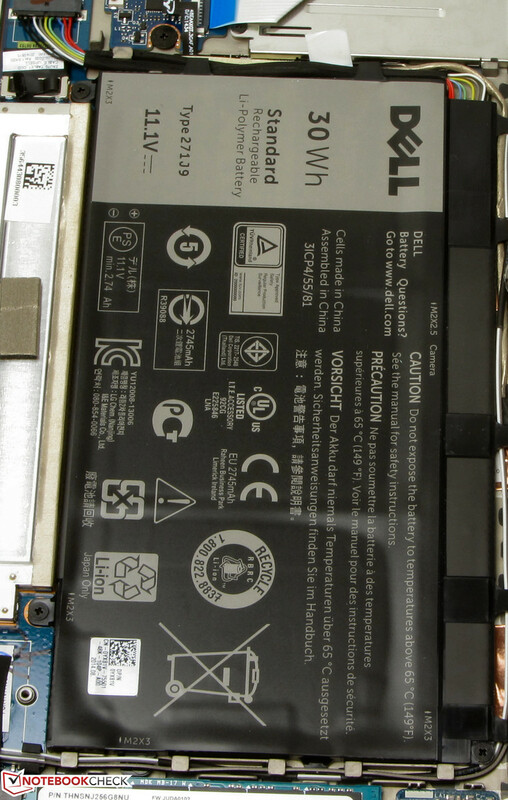 Dell located the stereo speakers at the bottom of the tablet element. They produce a rich and clear sound that lacks bass. It is easy to listen to them for prolonged periods, and you can adjust the sound with the preloaded "Dell Audio" software. A combined stereo jack is available. The Core M processor inside the Latitude is designed for low power consumption, so it is not surprising that the Latitude does not consume that much power in general. The idle value is below 10 Watts and the first couple of seconds during the stress test result in 16.1 Watts before the consumption drops significantly because the CPU and GPU are heavily throttled. The device has a lot of headroom since the provided power adaptor has a nominal output of 45 Watts. We performed all our measurements with the attached keyboard dock. The two rivals Fujitsu Lifebook T904 and Toshiba Portégé Z30t-A-10X even consume much less than the Latitude while idling – despite the significantly faster processors. 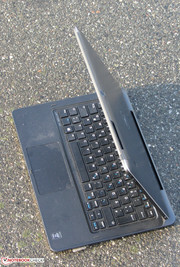 The Latitude manages an idle runtime of 15:52 hours, both the Fujitsu Lifebook T904 (17:35 hours) and the Toshiba Portégé Z30t-A-10X (19:54 hours) last longer. We simulate the idle scenario with the Battery Eater Reader’s Test that uses the minimum display brightness and the "Balanced" power profile, while all the wireless modules are deactivated. Load results in a runtime of 4:38 hours for the Latitude, the Fujitsu Lifebook T904 (2:00 hours) and the Toshiba Portégé Z30t-A-10X (2:58 hours) have to be recharged sooner. We determine the runtime under load with the Battery Eater Classic Test. 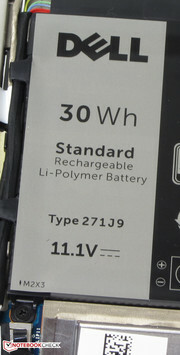 The display brightness is set to the maximum with the "Balanced" power profile, while the wireless modules are turned on. Our more realistic WLAN test determines a runtime of 8:42 hours for the Latitude, the Lifebook (6:51 hours) and Portégé (7:53 hours) are once again worse. This test uses a script to open a website every 40 seconds, while the display brightness is adjusted to around 150 cd/m². We test the video playback runtime with a loop of the short movie Big Buck Bunny (H.264, 1920x1080 pixels). The wireless modules are deactivated and the display is adjusted to around 150 cd/m². The Latitude lasts 7:52 hours; the battery of the Portégé only manages 6:32 hours. 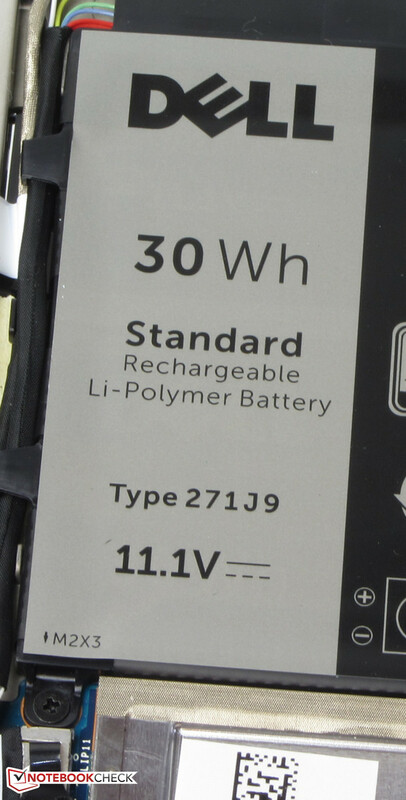 The Latitude has two batteries (tablet: 30 Wh, keyboard dock: 20 Wh). 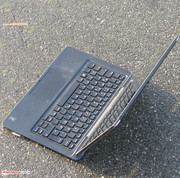 We performed our battery tests with the attached keyboard dock. 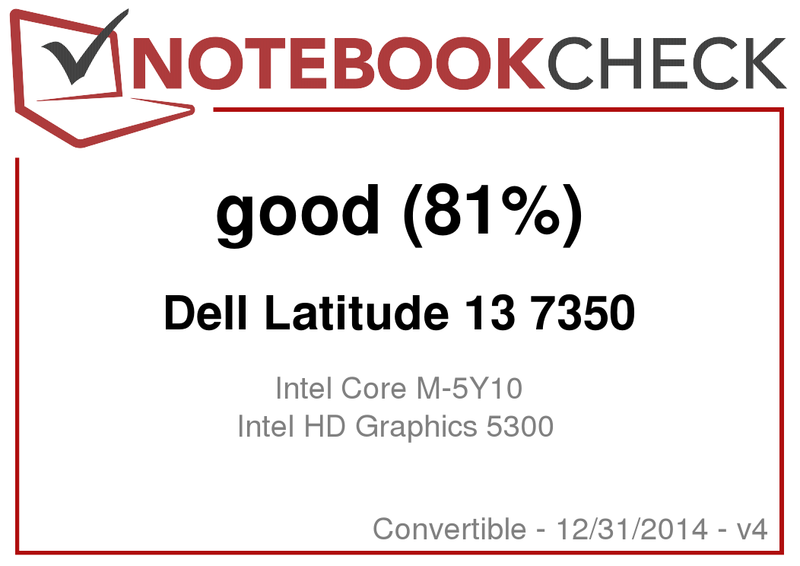 Note: Besides the "Balanced" power profile, the Latitude only has a power profile that was customized by Dell, so we performed all the runtime tests with the "Balanced" profile. The battery capacities (Dell: 50 Wh; Toshiba: 52 Wh; Fujitsu: 45 Wh) of the three devices are very similar, so the results are comparable. 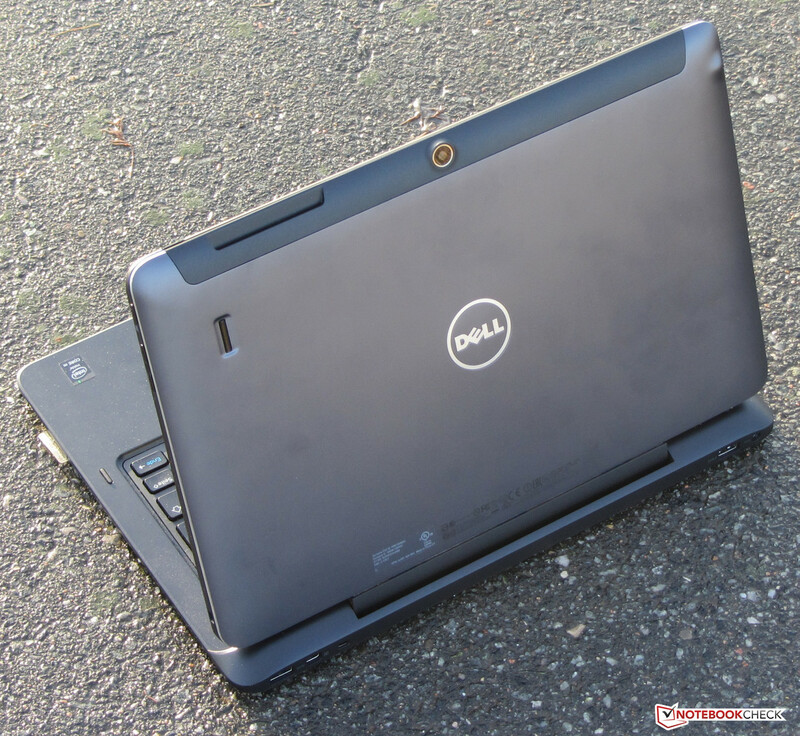 The focus of the Dell Latitude 13 7350 is not the highest possible CPU performance, it is quite similar to a Haswell Core i3 notebook in this respect. Instead, the device can impress with its silent operation. The Core M processor is passively cooled, and the storage solution is a Solid State Drive. The battery runtimes are very good, but this also applies to the runtimes of the rivals like the Fujitsu Lifebook T904 and the Toshiba Portégé Z30t-A-10X. As befits a business device, you can access the hardware of the Latitude; you just have to remove the back cover of the tablet element. 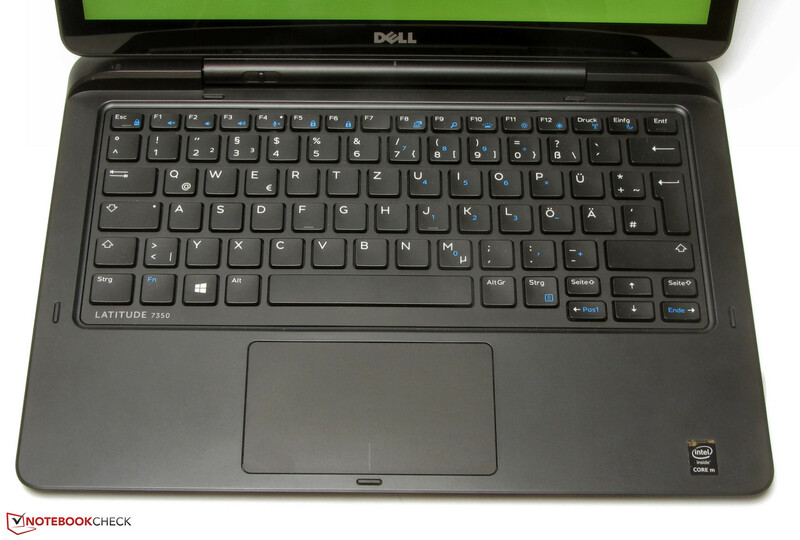 Dell also deserves praise for the keyboard of the Latitude that provides a pleasant typing experience. The most important part of a convertible is the display. 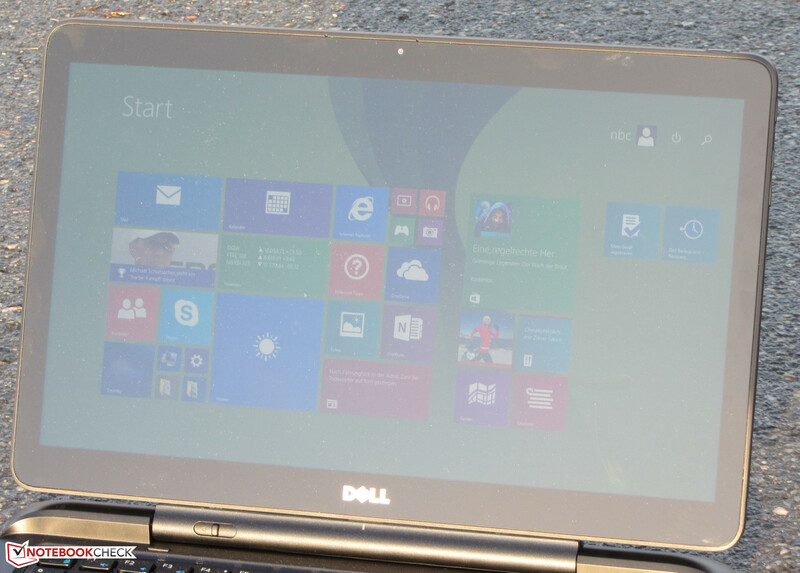 Dell does not disappoint and integrates a bright and high-contrast IPS panel that is protected by Gorilla Glass. Overall, the device is recommended for users that cannot decide between a tablet and a notebook/Ultrabook or do not want to use two devices. 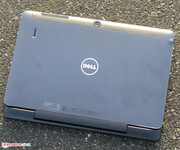 The Dell Latitude 13 7350. Test model courtesy of Dell. The input devices of the Latitude are convincing. The connection can be loosened with a small lever. Fingerprint and SmartCard reader are located at the tablet. It is possible to access the hardware. The device uses an M.2 SSD. A slot and antennas for an LTE modem are available as well. You could replace the BIOS battery. ...has a capacity of 30 Wh. A second battery is inside the keyboard dock (20 Wh). The power adaptor weighs 260 grams. It has a nominal output of 45 Watts. A USB recovery stick is provided. 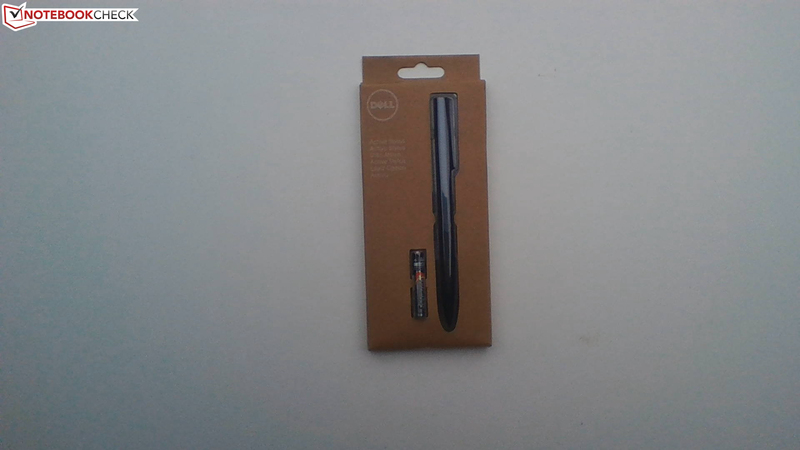 The Active Stylus has to be purchased separately. The bright and high-contrast IPS Full HD display, the silent operation and the battery runtime. Actually just an LTE modem, but Dell offers it as an option.